NEW CHARACTER PICTURE FOR JAYDEN! I won't be on here much due to exams coming up, I really need to at least try to understand my school work if I want to pass my exams and get into Uni so I doubt they'll be any story updates, unless the stress gets too much to me and I just need to relax. I'm also getting myself sorted out, I started CBT last week and hopefully that'll help me with all my problems. 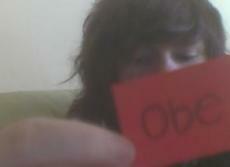 Call me Obe or Reid, the choice is yours. I have loads to read at the moment so I'm not going to be taking anymore reading requests for a while, Sorry! "To live is the rarest thing in the world. Most people exist - that is all." "Finishing a book is like you just took a child out in the back yard and shot it." "No matter how we close our eyes, there's a whole world out there bigger than ourselves and our dreams.."